On April 2, 1796, Bonaparte led his army forward into Italy. He was badly outnumbered. His 38,000 French soldiers faced 38,000 Austrians and their allies  25,000 Piedmontese. 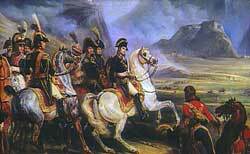 Bonaparte's plan was to isolate the Austrians from the Piedmontese, then conquer each separately. He would strike first at Piedmont. He spreads his forces out. The enemy doesnt know where he is so they begin to spread their forces out. Then at the last minute he quickly concentrates his forces, he achieves mass superiority at one point and then blasts them. Its lightning. 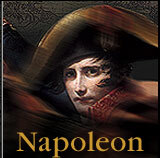 Napoleons armies could go up to thirty miles a day, the enemy were rolling on along at about six or seven miles a day. CONNELLY: Napoleon said there's nothing theoretical about war. You do what you have to do. You do it fast, and you surprise the enemy and shock him if you can. Move quickly and be ruthless about it. In just two weeks, he broke the back of Piedmonts army, crushing their troops with lightning attacks at the battles of Montenotte and Mondovi. One Piedmontese officer would later complain: "They sent a young madman who attacks right, left, and from the rear. It's an intolerable way of making war." On April 26, Piedmont surrendered. Bonaparte demanded gold and silver, and paid his troops the first real money they had seen in years. "Soldiers," he said, "we thank you." With Piedmont defeated, Bonaparte now pursued the Austrians, who retreated to the east, bewildered by the 26-year-old general and his new way of making war. As the Austrians fled, their rear guard hoped to slow Bonaparte down by making a stand at the little Italian village of Lodi.